January 7 - The Hythe Pier, Railway and Ferry is reopened after reconstruction from an accident where a dredger hit the pier in 2003. February 3 - The driver of a southbound Chicago 'L' Purple Line train drives past a signal indicating stop and collides with a standing Brown Line train south of the Merchandise Mart station; a third train also drives past the same signal and narrowly avoids colliding with the second train. February 21 - An eastbound empty Union Pacific Railroad train of autorack cars collides with a loaded train of hopper cars at about the 25th car behind the locomotives; both crewmen on the autorack train died in the accident. March 9 - Opening of Nottingham Express Transit in the United Kingdom. A runaway locomotive on Long Island Rail Road after it collided with vehicles at several level crossings, March 10. March 10 - The crew of a Long Island Rail Road switching job leave a locomotive with insufficient brakes on a hill where it rolls away, hits several vehicles at level crossings down the hill in Queens, New York, and finally catches fire after it comes to rest. March 31 - The Gyeongbu and Honam lines in Korea open. April 6 - Amtrak's northbound City of New Orleans passenger train encounters a section of misaligned track near Flora, Mississippi, and derails while traveling at 78 mph; one person dies and 46 others are injured in the derailment. May 19 - Two BNSF Railway trains operating under track warrants collide head-on near Gunter, Texas, due to the failure of the southbound train to comply with a warrant telling them to hold and await the northbound train; one crewman is killed. June 28 - A westbound Union Pacific Railroad (UP) freight train strikes the middle of an eastbound BNSF Railway freight train as the BNSF train was entering a siding near Maconda, Texas; a tank car in the UP train loaded with chlorine is ruptured causing three deaths and 30 injuries due to gas inhalation. Deltic 9000 Locomotives Ltd enters voluntary liquidation selling both locomotives that it had acquired as part of the Deltic 9000 Fund. September 21 - The remote control operator in charge of a train performing switching duties over Alton and Southern Railroad's hump yard in East St. Louis, Illinois, loses control of the train and it collides with tank cars in the yard carrying vinyl acetate that then ignite; about 140 people are evacuated, but no injuries are reported. Reopening of the Great Laxey Mine Railway which had been abandoned in 1929. October 16 - A pair of insulated joint bars fail under an eastbound Union Pacific Railroad freight train due to fatigue cracking, derailing the train near Pico Rivera, California; fuel spills from the locomotives' ruptured fuel tanks, and about 100 people are evacuated, but no injuries are reported. November 3 - A non-revenue Washington Metro train that did not have its brakes properly applied rolls backward and collides with a revenue train standing at the Woodley Park-Zoo/Adams Morgan station where it was making a station stop; about 20 people are taken to local hospitals for treatment. 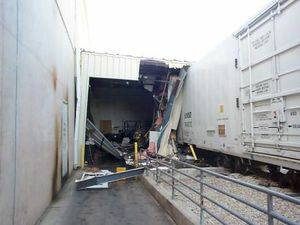 November 10 - A Union Pacific Railroad train performing switching maneuvers in San Antonio, Texas, collides with a standing rail car mover and three refrigerator cars, pushing the last car beyond the siding's wheel stops and into a warehouse building; one person in the building is killed and another aboard one of the cars is injured. December 24 - After a nearly four month shutdown due to technical problems, the Las Vegas Monorail reopens for regular service. The interchange between Hong Kong MTR's Tsuen Wan Line and KCR East Rail at Tsim Sha Tsui opens. Woody Bay railway station reopens. ↑ Railroad Accident Brief: Collision of Two Chicago Transit Authority Trains, Chicago, Illinois, February 3, 2004. United States National Transportation Safety Board (2004-07-07). Retrieved on 2008-01-08. ↑ Railroad Accident Brief: Collision of Two Union Pacific Railroad Trains, Carrizozo, New Mexico, February 21, 2004. United States National Transportation Safety Board (2006-10-31). Retrieved on 2008-01-06. ↑ Railroad Accident Brief: RAB-05/01. United States National Transportation Safety Board (2005-04-18). Retrieved on 2008-01-07. ↑ Railroad Accident Report: Derailment of Amtrak Train No. 58, City of New Orleans Near Flora, Mississippi, April 6, 2004. United States National Transportation Safety Board. Retrieved on 2008-01-07. ↑ Railroad Accident Report: Collision Between Two BNSF Railway Company Freight Trains Near Gunter, Texas, May 19, 2004. United States National Transportation Safety Board. Retrieved on 2008-01-07. ↑ Railroad Accident Report: Collision of Union Pacific Railroad Train MHOTU-23 With BNSF Railway Company Train MEAP-TUL-126-D With Subsequent Derailment and Hazardous Materials Release, Macdona, Texas, June 28, 2004. United States National Transportation Safety Board. Retrieved on 2008-01-07. ↑ Railroad Accident Brief: Collision, derailment, hazardous materials release, and fire in Alton and Southern Railway Company classification hump yard in East St. Louis, Illinois, September 21, 2004. United States National Transportation Safety Board (2005-06-27). Retrieved on 2008-01-07. ↑ Railroad Accident Brief: Derailment of Union Pacific (UP) freight train ZLAMN-16 near Pico Rivera, California, October 16, 2004. United States National Transportation Safety Board (2005-05-31). Retrieved on 2008-01-07. ↑ Railroad Accident Report: Collision Between Two Washington Metropolitan Area Transit Authority Trains at the Woodley Park-Zoo/Adams Morgan Station in Washington, D.C., November 3, 2004. United States National Transportation Safety Board. Retrieved on 2008-01-07. 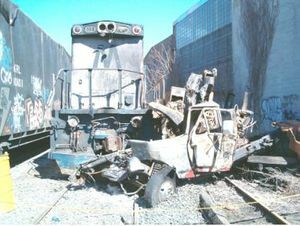 ↑ Railroad Accident Brief: Collision of Union Pacific Railroad Train into Crystal Cold Storage Warehouse Maintenance Building in San Antonio, Texas, November 10, 2004. United States National Transportation Safety Board (2005-08-31). Retrieved on 2008-01-07. This page was last edited on 24 January 2012, at 20:43.